Microsoft has just released the official Windows 10 Updates for every genuine users.Or if you already installed insider preview then you might be aware that drivers are not installing properly in windows 10. And even there is no directly accessible option to disable driver signature like previews Window8 version. But there is little trick to disable driver signature in windows 10 too. Guide to install Unsigned drivers in Windows10. Step 1. 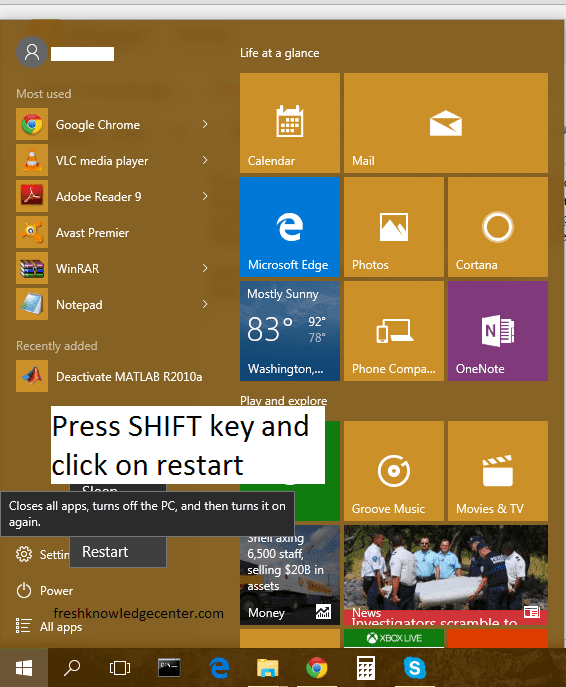 Click on Microsoft icon or press Win key. Step 2. Now in power option Press SHIFT key and click Restart. Step 3. Now your computer will restart and some options will pop up.Click on Troubleshoot option. And then click on Advance Option > Start Up settings. Now click on restart. Step 4. Now Your computer will restart with some options shown in screen.Press/Type 7 and it will restart again. step 5. Done! Now you can try to install any third party drivers. Install VIA HD Audio drivers. First do above 5 steps and restart computer. It must require to boot your computer in Disabled driver signature mode. Now download VIA HD Audio driver for Window 8 from given link below. Because official drivers are not available for Windows10. Now install it. Most probably it will be installed successfully and after restart Icon should be visible in bottom bar as shown in below image, other wise go to device manager and uninstall Audio drivers and restart your computer. Now Again install drivers. Done! Thank you for sharing ...before in my computer VIA HD audio drivers not worked or installed. It automatically change the drivers to windows default.Now i successfully installed it!